At thirteen, Susanna doesn’t realize she has a dysfunctional family – they are just hers. But when family secrets emerge that threaten Susanna and her siblings, she begins to see that things are not as simple as she’s always believed. Time passes, and as Susanna grows older to the backdrop of the 1960s, her best friends Calvin and Shelly are right beside her -- until her feelings for Calvin grow beyond friendship, and suddenly the world has turned upside down. Not even Shelly’s brash humor can break through her heartbreak as Calvin deploys to Vietnam, in love with someone else and even more out of reach than ever. But then Susanna realizes that Calvin needs her like never before, and she won't abandon him - even at the expense of her own heart. And as trouble at home reaches its pinnacle, Susanna's sense of honor, and fault, are challenged by Calvin’s experiences in war. Now, even as her love for Calvin threatens to destroy her, she finds herself at a crossroads - repeat the mistakes of the past or face the awful truth. And, with her dysfunctional family surrounding her, it all boils down to a choice between fear and hope. I can almost feel my review blog co-author rolling her eyes when she sees that I am reviewing a novel about a thirteen year old girl. Normally, we NEVER read anything involving thirteen year old girls... or boys for that matter. Generally speaking, we don't like them. But this author graciously donated signed copies of this book for a literary function I was speaking at. After first being attracted by this beautiful cover, I read just a few pages... and yes, I got sucked into 1965 Kentucky! I am so glad I temporarily set aside my list of "things I generally don't read" because this book was worth reading every single page! 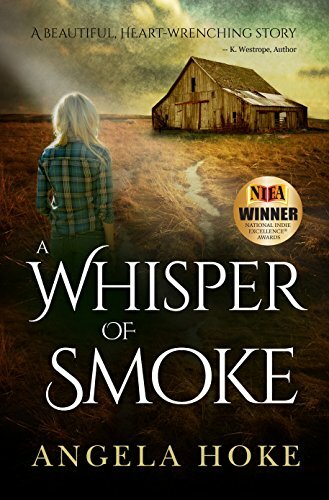 A Whisper of Smoke is a beautifully written story about a girl and her family dealing with painful secrets, life, love and loss. Angela Hoke developed these characters so fully that you could "feel" their presence and her storyline pulled me right back into the 1960's with so many little reminders of things I had long since forgotten. The emotions I felt as I read this amazing novel ran the gambit from smiling and laughing out loud to tears streaming down my cheeks, choking back sobs. I applaud Angela Hoke for having the ability to write about a subject so many people have difficulty acknowledging. And she wrote about it with so much depth of emotion and with understanding that so many people cannot face. Life is not black and white with rigid guidelines. Life contains too many variables. This author handled it all beautifully. I won't give away spoilers, but I do want to comment on the letters written between Susanna and Calvin while he was in Vietnam. Being married to a Vietnam veteran myself, the realism in those letters brought to life images long past. The letters... and this book... are beautifully written. If I could, I would give this review six or more stars (or wine glasses). Angela Hoke has worked for many years in accounting, writing in her spare time. She began writing at the age of eight, when she produced a neighborhood newspaper, until an expose written based on sketchy facts shut her down for good. A Whisper of Smoke is her debut novel, and winner of the 2015 National Indie Excellence Book Award, the 2015 Readers’ Favorite Gold Medal, the 2014 GRW Maggie Award for Excellence and the 2014 Heart of Denver Aspen Gold Award. It was also a finalist in the 2015 International Book Awards. Her short story, The Ceremony (inspired by a scene in this book), was a finalist in the New Millennium Writing Contest, and she studied craft at the Algonkian Writers’ Conference. Her second novel, A Painted Lily, is expected to be released in May 2017. She lives in Nashville, TN with her family, one tiny dog and a bob-tailed cat. I grew up in Kentucky, but I’ve lived in Nashville for over twenty years. I’ve been writing since I was eight years old. I started with a newspaper that I wrote, illustrated and distributed with the help of my mom’s work copy machine. I had a successful run of two editions before publishing an exposé based on sketchy facts in my third paper – that one shut me down for good! Since then, I’ve become an accountant that writes, sings, ballroom dances and paints in her spare time, a recently remarried wife and a mother, which is my favorite role of all. I was a very good student – all A’s, or very nearly so. I had scholarships to college which was good, because I married young (at eighteen) and was living on my own with my new husband. We were broke and knew it (I always wonder how some people can say they were broke but didn’t know it – it was very apparent to us J). I guess you could say I was semi-popular in school – I was never excluded from anything and I had plenty of friends, but only a few really close ones. I bow down to Barbara Kingsolver. Her use of the English language and imagery are incredible. J.K. Rowling has also been a huge inspiration to me. Even though we write different types of books, her ability to develop characters and create relationships is amazing to me. Finally, I love Diana Gabaldon – her gift of dialogue and her ability to convey everyday life in eighteenth century Scotland are awe-inspiring. Tony Ramirez is a high-end real estate agent living the fast life in Miami, while his best friend Becca, social worker extraordinaire, does her best to keep him grounded. Still, he’s never been very connected to his past as a Cuban immigrant whose family fled Cuba in 1961, soon after Castro’s regime took over – until a tragedy rocks his family and he discovers that he actually fled his birth country, not with his family as he originally thought, but in the care of his oldest brother Pedro. As events unfold, he learns that not only were he and Pedro initially left behind, they were evacuated as part of Operation Pedro Pan (in English, Peter Pan), a crusade by the Catholic Church to save Cuban children by helping them escape to the United States. As Tony’s search for the truth takes them into the past and to beautiful, tortured Cuba, only Becca’s friendship can help him unlock the secrets that will change his world. But while Tony searches his soul, and his past, for answers, his relationship with Becca is stretched to its limits. And in the land of Tony’s past, a land suspended in time, Becca may have found a path to a new future – one that may or may not include Tony. 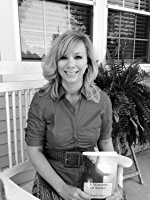 From the Amazon best-selling and multiple award-winning author of A Whisper of Smoke, A Painted Lily represents the "best of relationship fiction, exploring personal struggles and growth delicately woven through a story of friendship, love and a quest for answers that many readers will relate to." How would you describe A Whisper of Smoke? It’s available in trade paperback on-line at Amazon. It’s available electronically for Kindle on Amazon. I just finished A Painted Lily, described above. I have an idea for my next novel, but it’s much too early to articulate – I’m still fleshing out the idea. Occasionally, I also work on my young adult book about a teenage girl who goes on vacation to Ireland with her family and gets kidnapped by Leprechauns. Enough said J. Your YA book sounds so different from your first book. Tell me more! As I said, my first book is up-market women’s fiction, which is where my heart is. A Painted Lily is in the same genre, I think, even though one of the main characters is a man, since it still focuses on relationships and personal growth. But I also love and often read young adult books, so the Leprechaun book is still firmly inside my sphere of influence and has been a lot of fun to write. That said, since it is so different, I may use a pen name to publish it. No, but my Leprechaun book is. I plan to write three books about Briley Dunn and her adventures with the Leprechauns.